An annually exercisable feedback mechanism in tax-deferred retirement accounts (e.g. 401(k), IRA or RRSP) is provided to assess whether a pre-retiree is on track to achieve financial objectives for retirement and identify corrective steps required to align plan execution and expectations. Shortfalls to objectives can be eliminated by adjusting: annual savings-rate, retirement age and if necessary the planned retirement expenses. A realistic plan can be converged-to by understanding the trade-offs between these adjustable variables driving plan outcome. If you are already retired, you might want to share with your still working children or friends. Once you start retirement there is little that can be done to alter the available assets; one is essentially required to work with what’s available during retirement. However those still working, i.e. are pre-retirement, have the ability to continue to accumulate assets toward the objective of achieving desired retirement income. The questions are always: What are my objectives? Are objectives realistic given current plan? What is required corrective action? Based on these assumptions the required assets at retirement is calculated by simply multiplying the before-tax required income net of any expected pensions by multiplying by an income multiplier in the range of 30-33x for retirement ages ranging from 70-60. The annual savings rate, retirement age and after-tax and pensions retirement expenses can be estimated to achieve objectives; then using the feedback built into the spreadsheet we can fine tune the plan. The tool will provide the expected (not guaranteed) outcome, in each case assuming that investments are in Risk-Free asset (unless indicated otherwise, as in the case of the SWP where potential income is calculated at not just 0% but 20%/40%/60% stock allocations). Should the calculated outcome fall short of desired retirement objectives, there are essentially three variables to adjust: increase savings rate (as a percent of income), delay retirement (to a realistic age), and/or reduce expenses. Also note, starting in Line 18, that the $85K/year expenses in retirement gross up to $106K/year pre-tax when tax-rate is 20%, and it is reduced by the $25K pension, leaving a requirement of $81K/year to be met from the accumulated retirement assets. Given the current inputs, the $85K desired expense coverage falls well short of the estimated achievable $70k, as shown in Line 19. The Expected and Target assets Graph shows the about $600K shortfall at age 60 between the Target (required) assets (blue line) and the Expected assets between age 41 and 60 as indicated by the rising bars toward the blue line (objective). The second graph (Figure 2) immediately above shows Expected retirement outcomes using the three approaches mentioned earlier: 1.SWP using Waring-Siegel to calculate maximum draw; the initial maximum draw is shown for 0%/20%/40%/60% (assuming risk tolerance permits) stock allocations (blue bars, all stock allocations fall short of desired/required $81K income from assets), 2. Equal annual income to age 85 leaving sufficient funds for immediate annuitization at age 85 plus (with a further $400K reserve) shown in brown bars (at $50K, well short of $81K), and 3. 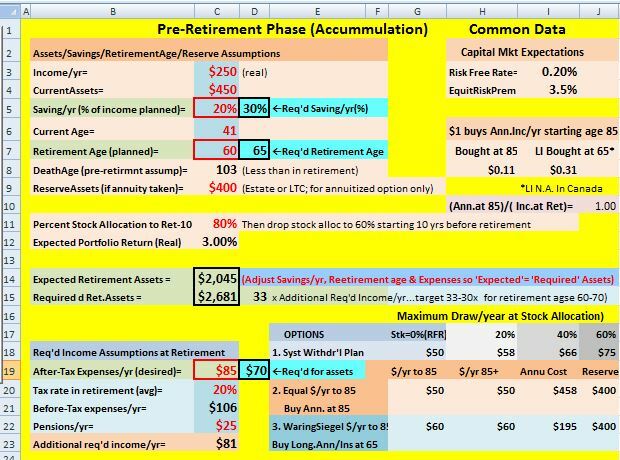 Longevity Insurance bought at age 65 to deliver income starting at age 85 (with $400K reserve) plus a W-S approach to calculate annual income (0% stock assumed here) shown in green bars (at $60K, well short of $81K objective). We have primarily three ways to close the expected $600K gap in expected assets: (1) increase savings rate from 20% to 30%/year or, (2) increase retirement age from 60 to 65, or, (3) reduce after-tax expenses in retirement from $85K to $71K. Any ONE of these would close the gap, but the impact may be too severe to accept. However we may be able to get an acceptable outcome by adjusting all three variables in a less dramatic manner. Instead let’s extract a pound of flesh from each of these three variables to reach some sort of acceptable outcome that we could still live with. Using trial and error values, we eventually arrive with one possible combination like: savings rate increased from 20% to 21% (Line 5), retirement age increased from 60 to 63 (Line 7), and (after-tax) expenses to be covered was decreased from $85K to $80K (Line 19), leading to additional before tax income (Line 23) of $75K from the tax-deferred retirement savings to cover retirement expenses now reduced from $81K/yr (in Figure 1). The results from the tool/spreadsheet are shown in Figure 3 and Figure 4. 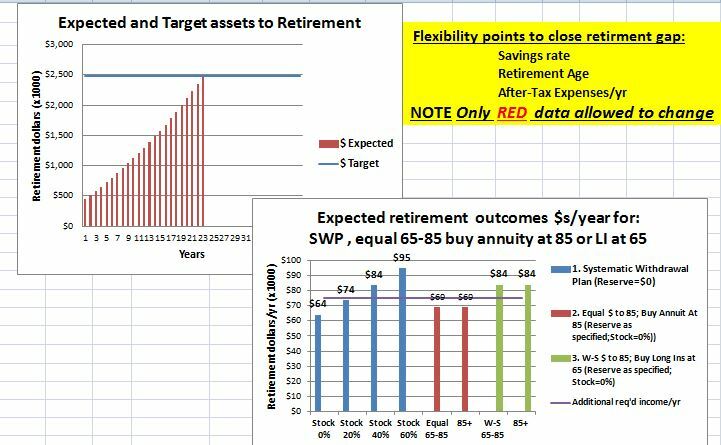 As you can see graphically in Expected and Target assets graph in Figure 4 above, the gap is closed to the blue line (though the blue line is a little lower due to lower retirement expenses) the brown bars now go to age 63 before gap is eliminated. In Line 23 of Figure 3 above you can see that in retirement we’ll need $75K (instead of $81K) of before-tax income from retirement assets, in addition to the $25K pension. Looking at the Expected retirement outcomes graph in Figure 4 that we’d have to go with at least about 20% stock allocation using the W-S based Systematic Withdrawal Plan approach (blue bars) to get almost to the new target, the blue horizontal line at $75K. The green bars, with the longevity insurance, have the potential to deliver about $84K to age 85 (via a fixed term SWP) and then continue to do so starting at age 85+ until the last of the couple dies, from the longevity insurance income stream. (This is the scenario where a Longevity Annuity is purchased at age 65 which starts delivering annuity sourced income at age 85.) This example, as expected, shows the clear superiority of a longevity insurance/annuity provides a vastly superior outcome compared to an immediate annuity, with a 21% higher annual income stream. (Sorry Canadians, you are still out of luck if you would like to buy a longevity insurance; no visible initiative has been taken by governments or life insurance industry to try to introduce such a product- so it’s not available in Canada.) Still, the best expected outcome, for those whose risk tolerance permits, is using the Waring-Siegel approach using an acceptable level of risk; in this example a risk level as low as 20% stock is sufficient. A tool to help generate, test and modify a retirement plan aimed at achieving retirement goals and objectives is provided. Ideally you’d want to run it annually to reforecast expected outcome with fresh input data. The tool is also useful as a feedback mechanism to monitor whether one is on track to achieve retirement objectives. 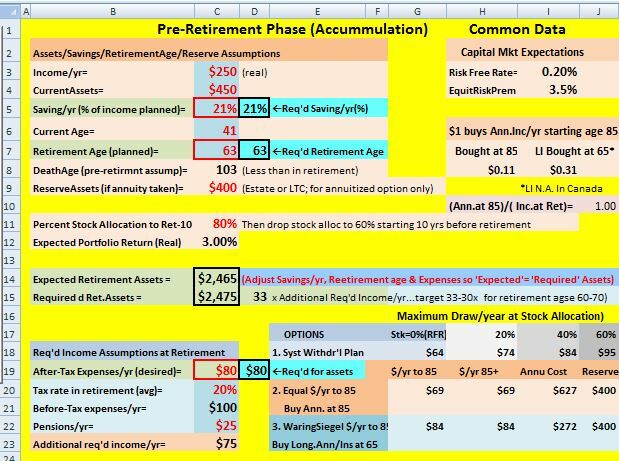 As you approach your retirement date, and hopefully the goal/objectives (assets/age/retirement income), then you can move to the next level of retirement expense granularity so you can size and understand the difference between “Fixed” and “Discretionary” expenses, as discussed in Stocks in retirement? Asset allocation considerations in retirement; the smaller the proportion the fixed expenses are of the annual expenses, the more flexibility (ability to take risk) one has, and thus use higher stock allocation to improve expenses outcomes. Then you can move on to use the “Stock allocation in retirement” tool which factors in ‘risk tolerance’ and ‘required returns’ to achieve objectives.